How comforting it was for the Sun Valley Suns men's senior hockey team to start its 20-game 2010-11 campaign last weekend on resort ice with goalie Ryan Thomson back in the net for his eighth season. Thomson, bouncing back from a high groin tear that knocked him out of the final four games last season, registered his 53rd and 54th wins in the Suns net making a total 55 saves on 58 shots in Sun Valley's 5-2 and 7-1 sweep of the Park City (Utah) Pioneers. He didn't allow a goal in the third periods—and in those 20 minutes Friday and Saturday the Suns increased their margins from 3-2 and 4-1 to the eventual final lopsided outcomes. "Ryan was awesome," said Suns forward/general manager Charles Friedman. Third-year forward Jordan Pritchett scored a pair of goals in Friday's 5-2 victory, while Taylor Rothgeb and Blake Jenson added power play scores. Rookie defenseman Sean Rynes tallied his first Suns goal to get Sun Valley off the mark early. On Saturday, the Suns jumped out to a 4-0 first period lead with three goals in a four-minute span. Despite playing shorthanded for much of the second and third periods because of a slew of penalties, Sun Valley increased its lead to 7-1—the final two goals by Ryan Enrico (his 90th) and Matt Ward coming shorthanded. Friedman said, "We were a little rusty Friday night but Ryan backstopped us well when we were mis-communicating out there. Saturday night, we were clicking as a whole team and had a much more solid effort." Sixteen different Suns recorded goals or assists last weekend at Sun Valley Skating Center. On the scoresheet, the Suns out-pointed the short-benched Pioneers 30-5. The Suns box was crowded for the team's debut, in contrast to the relatively few 13 players Park City brought to Idaho off its 27-player roster. Three or four of Park City's top scorers didn't make the trip. Pioneers pick-up goalie Chris North (47 saves) played with Park City for the first time. It means Sun Valley (2-0) will likely face a tougher Pioneers squad (2-4) on its visit to Utah for the only two Suns road games Jan. 7-8. After all, the Pioneers beat the host Jackson Hole Moose 4-3 in overtime in the season opener Nov. 12. One player the Suns won't have for its New Year's weekend series with Utah Blizzard Dec. 31-Jan. 1 is defenseman Trevor Thomas. On Saturday night, combative Thomas got into a donnybrook in front of the raucous Beer Garden in the second period—and liked the fisticuffs so much that he instigated another fight in front of the penalty box in period three. Thomas wound up with two five-minute major penalties and enough penalty minutes that he drew two game misconducts. For Saturday's game, Sun Valley had 48 penalty minutes to Park City's 13—another reason the upcoming trip to Utah might be interesting. "It will be a good match," said Friedman. Check today's Express Web site for last weekend's summary and updated team stats. Second-year Idaho Steelheads defenseman Cody Lampl, 24, of Ketchum is now tied for sixth place in overall Steelies team scoring with no goals and 11 assists in 21 games. The 5-10, 165-pound former Colorado College and Sun Valley Suns player has three two-assist games for the Steelheads (11-7-5). Although the host Las Vegas Wranglers (13-4-2) swept the Steelies 4-1 and 6-3 last weekend, Idaho is still in second place in the ECHL Western Mountain Division behind the Utah Grizzlies. The Steelheads host Victoria Salmon Kings today, Wednesday and Friday, Dec. 17 at 7:10 p.m. at Boise's Qwest Arena. They go on a six-game road trip to Las Vegas, Utah and Alaska before returning home to play Bakersfield Friday, Dec. 31. On Nov. 27, Lampl had a cup of coffee with the American Hockey League's Abbotsford (B.C., Canada) Heat, skating for the Heat in a 3-1 loss. It was Lampl's first action in the AHL, highest level of minor league hockey in North America. FIRST PERIOD—(1) SV, Sean Rynes 1 (Charles Friedman, Chad Levitan), 7:20. (2) Park City, Aaron Dufford (Sean Baron), 8:01. SECOND PERIOD—(3) Park City, Baron (unassisted), 9:49. (4) SV, Taylor Rothgeb 1 (Blake Jenson, Trevor Thomas), 10:13, power play goal. (5) SV, Jenson 1 (Rynes, Ivars Muzis), 16:35, power play goal. THIRD PERIOD—(6) SV, Jordan Pritchett 1 (Jon Duval), 5:51. (7) SV, Pritchett 2 (Matt Ward, Eric Demment), 19:46. SHOTS ON GOAL—Park City 9-9-12 for 30; Sun Valley 4-14-9 for 27. GOALIES—Park City, Chris North (22 saves); Sun Valley, Ryan Thomson (28 saves, 1-0-0 record). NOTES—Park City Pioneers brought 13 players, less than half its 28-player roster. The Utah squad came without its captain, David Imonti, and three other of the Pioneers leading scorers, Erik Milliron (3 goals), Aaron Burrell (3 goals) and Thomas Gata (2 goals, 2 assists). Entering the Sun Valley series, the Pioneers were 2-2 at the start of their 18-game season schedule. They won their opener Nov. 12 4-3 in overtime over the Jackson Hole Moose at Snow King Center in Wyoming, and then lost the Saturday night game to the Moose 5-3. Park City lost 8-5 at home to Utah Blizzard Nov. 20 and won 5-2 at Utah County in Provo Nov. 27. The Pioneers entertain the Sun Valley suns Jan. 7-8 after the holiday break. It will be the only Suns road action planned this winter. FIRST PERIOD—(1) SV, Taylor Rothgeb 2 (unassisted), 1:54. (2) SV, Jordan Pritchett 3 (Jon Duval, Ryan Enrico), 8:03. (3) SV, Duval 1 (Enrico, Pritchett), 10:28. (4) SV, Jamie Ellison 1 (Sean Rynes), 12:25. SECOND PERIOD—(5) Park City, Matt Long (Adam Blossey), 9:03, power play goal. THIRD PERIOD—(6) SV, Chad Levitan 1 (Cody Proctor, Josh Jacobson), 5:21. (7) SV, Enrico 1 (Ellison, Zak Greenawalt), 14:09, shorthanded goal. (8) SV, Matt Ward 1 (unassisted), 19:59, shorthanded goal. SHOTS ON GOAL—Park City 9-10-9 for 28; Sun Valley 15-8-9 for 32. GOALIES—Park City, Chris North (25 saves); Sun Valley, Ryan Thomson (27 saves, 2-0-0 record). OFFICIALS—Bobby Noyes and Chris Benson. NOTES—Suns forward lines were Ryan Enrico-Jon Duval-Jordan Pritchett, Cody Proctor-Chad Levitan-Charles Friedman, Taylor Rothgeb-Jamie Ellison-Blake Jenson, Bobby Sloper-Matt Ward-Mike Connor. The defensemen were Kris Webster-Sean Rynes, Ivars Muzis-Trevor Thomas and Zak Greenawalt-Josh Jacobson. Back-up goalie was Billy Cook, while Cody Levitan was back-up to Thomson in Friday's game......The Suns were 2-for-6 on the power play this weekend, and Park City was 1-for-8. The Suns had 52 penalty minutes and Park City 23....Defenseman Trevor Thomas accounted for 26 of the Suns penalty minutes, mainly with two fights tonight. 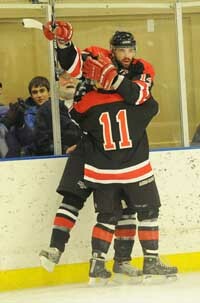 At the very end of the second period in front of the raucous Beer Garden, Thomas battled with Park City's Mike Diersen. Each drew 5-minute fighting penalties. Midway through the third period in front of the penalty box, Thomas launched another brawl with Park City's Rob Chrissie. This time, the officials threw the book at Thomas. He drew another 5-minute fighting penalty along with a checking-from behind minor, an instigator minor and a 10-minute misconduct. With his second fighting major, Thomas automatically received a game misconduct, eliminating him from participating in the next Suns contest. Because he had the two majors and five other penalties, Thomas drew an additional game misconduct—so he's done for two games. Shots—Thomson 58. Saves—Thomson 55. Shootout saves—. Shootout goals allowed—0. Shutouts—0. Empty net goals—0. Two-goal games (1)—Jordan Pritchett 1. Three-goal hat tricks (or more)—. Power play goals (2-6, 33%)—Blake Jenson 1, Taylor Rothgeb 1. Power play goals (opposition): 1-8, (13%). Suns shorthanded goals (2)—Matt Ward 1, Ryan Enrico 1. Season penalty minutes: SV 52, opponents 23.